Telerobotics (controlling robotic devices from a distance) has enjoyed a rich history. It has led to many practical applications and to a broad vision of interacting with environments far removed from the user. With an ultimate goal of developing a community of self-manufacturing autonomous robots, we have built RISCBOT 1, a web-controlled autonomous navigational robot with recognition capabilities, as a first step in this direction. RISCBOT can be commanded via the Internet to move to particular offices in the Engineering Technology Building of the University of Bridgeport. It localizes and fulfills online users’ requests of navigating to desired rooms. Navigation is performed with the help of the cameras and ultrasonic sensors. The robot processes images from the cameras to differentiate between doors, walls and obstacles. Images captured from the camera are encoded and broadcast over the web. Online users can view real time video feedback from the robot and a global surveillance camera. Our web-controlled mobile robot can be utilized to perform video surveillance, and many other functions within the areas of remote material handling, service robotics, online tour guidance, remote inspection and security. RISCBOT can also be used in a multi-agent environment to monitor and supervise collective tasks. The next step within the self-replicating robots project will involve adding manipulation capabilities (robotic arm) to RISCBOT. Furthermore, we intend to develop RISCBOT II to collaborate with RISCBOT and be able to use raw materials, components, links and sensory elements for assembling / manufacturing “Baby RISCBOTs” (with similar sensing and manipulation capabilities) who would continue the tradition of self replication. 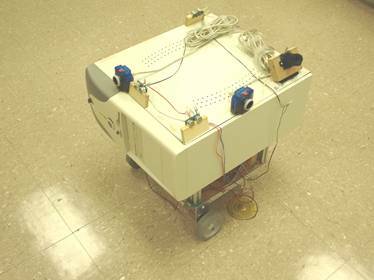 “RISCBOT” name has been coined from RISC lab (Interdisciplinary Robotics, Intelligent Sensing, and Control laboratory) and ‘BOT’ from robot.